- the cigar and gigantic car having already been used in the opening song. But only someone with a puppy-like dil - full of love for its people - would introduce that same idea with the least judgmental and most empathetic portrayal of Iraqi war vets or gays in the military that I have ever seen in mainstream media. Dostana did chew up a few of my favorite shoes. The limp-wristed fictional flashback to Sam and Kunal's meeting in Venice was eye-roll-y, though at least through its commitment to stereotype it made an excuse to include ridiculous clothes, which I always enjoy. Though I wouldn't be at all surprised to see any of these outfits on some other movie's show-stopper song backup dancers. More nuanced than Satish Shah in Masti, and thank goodness Boman rather than somebody else was in this part, but still. This to me was overkill; to be fair, it was on the same scale of overkill as Bollywood comic relief characters often seem to me, and in a movie that's basically a comedy, the even-more-comic person is going to have to be waaaay out there. But as many, many people have said about this film's portrayal and discussion - and even basic inclusion as lead characters - of homosexuality: puppy baby steps. And M is also very likable (if silly), voices an important message, and is not given much screen time. If the filmmakers had to write him in, they did it in the best possible way. but somehow I read her as a satire rather than stereotype, I guess because her character type is well-established in Hindi cinema and thus could be pushed to extremes and toyed with to great effect in an understood context. And probably worst of all, I haven't heard this explanation of homosexuality since occasional run-ins with conservative Christian students in college. I was shocked the writers didn't - couldn't? - do any better than this, but thankfully they left it alone for the rest of the movie. The good faaaaar outweighed the bad for me. Dostana has such a good attitude that I couldn't be annoyed for very long. I'm not quite ready to call Abhishek and John the new Shashitabh, as someone suggested to me when they watched this, but they certainly are very strong together. I still don't understand why John Abraham is a major star, but these filmmakers created a role that took full advantage of his natural assets* and default expression and demeanor. If he can be consistently good-natured and mostly quiet, then that leaves ample room for the many, many talents of Abhishek. I adored talky, smart, sweet, imaginative Sam (who reminded me of J. D. on Scrubs). Awww, Sam even likes aunty! Abhishek also got to make good on his physical assets - namely tall and sort of uncoordinated (again with the puppy) - to great comic effect, reminding me (very favorably) of the Motorola Rokr ad in which he dances with mini-Abhishek in the bathroom. His verbal comic abilities are also in full swing. His gloating exchange with John about the attractiveness of chest hair made me laugh so hard I had to pause the movie. The film was packed with small, almost throw-away moments like this one that racked up many points with me for adding so much flavor and lots of satisfying everyday-ness. Most of the fun of life is not planned jokes - it's in the things your friends say in passing or spur of the moment. This kind of thing makes me happy in any movie, but here it was a clever and essential part of grounding The Gay Thing in relative calm and no-big-deal-ness (with the exception of the relentless voice in the background score repeating "you dirty boy" - what was with that?). Well conceived, well executed. Dostana's real point, after all, is friendship - the joys and responsibilities of friendship - and everything else is to the side. Other dubious fashion choices that perhaps were the real reason Neha didn't get promoted until she had a boss who appreciated the leg shown by egregious formal shorts. Our favorite gora of the new millennium, Steven Baker, leading the way in a cast of bit-part white folks who are totally not annoying for once! Sure to be Tom Alter in his own way. Maa's most excellent song - which, by the way, I had hated everytime I'd heard it because of the stupid cartoon chipmunk voice but loved in context (and the remix too). Riffing on movies, but not the ones I'd expected. Scaredy-cat Sam can't watch scary movies either! I'm inviting him over for my next Ramsay Brothers screening. Can anyone confirm who this is? 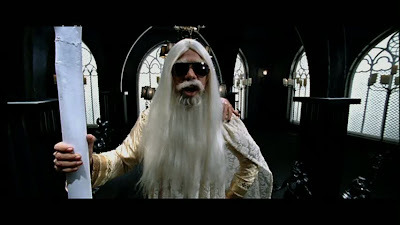 I really think it looks like Kader Khan, whom we have all seen in plenty of fake beards and mustaches over the years, which would be super. If you want more, my sometimes snarky and usually spoiler-y liveblogging-ish tweets on Dostana begin here and ramble over a few hours to here. I love it. I didn't love quite all of it, but I loved enough of it that I am more than willing to put up with the flaws. Good intentions can make the world of difference, can't they? Warm, relaxed, fun, and affectionate, utterly lacking in judgment and mean-spiritedness, Dostana is a truly dear movie. And to end, one of my favorite unimportant details about the film: the Wonderful World of Abhishek's Scarves! And I *want* the scarves! I covet them too! He wears a lot of ombré shirts, but it's the smokey blue ombré scarf with bandhani ends that I like most. I will read the post in full when I'm not on my break at work (although the quick skim already gave me the giggles). Just had to add: just this morning, my husband asked me what CD has "The Jawa Song" on it. It took me a minute to realize he meant "Maa Da Laadla," which I am prone to jumping around the apartment to. I haven't been able to rewatch Dostana for the problems I had with its second half (manipulativeness and ..yeah) but I did quite enjoy the ride on my first watch. I really liked Boman, because he's Boman, and thought there was a lot of good when it came to the portrayal of homosexuality, even though a ton of it was undoubtedly stereotypical. RE: choice, actually had some interesting discussions of this on Bollywhat, where somebody explained that in India it's not so much "you choose your sexual identity" but rather, you choose to be out with it, which of course, you do. So when people object to homosexuality, they object to gays being out of the closet. And when they say, "it's okay, it's a choice", they're saying "it's okay to make that choice, we shouldn't judge them for it!" (= it's okay to be out). Not sure if that's a correct interpretation but it's a view worth considering. Abhi was a gem, John not so much - which is why I liked them but felt they could've been so much more together. 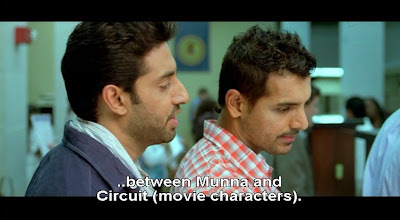 I think this movie got the maximum possible return on the John Abraham Patented Thinking Expression. When I first heard the premise, I was deeply concerned as I don't think Hindi mainstream cinema has done so well portraying people with handicaps or people with different lifestyles. But this came out (Ha!) much better than I thought - and mostly I think that was due to the really nice performances and chemistry of John and Abhishek. I really enjoyed the flashback meeting scene as the OTT camp was, I thought, a result of straighter than straight Sam trying madly to think of how 2 boys might have met andthrowing every single cliche in to the story. And the matching sailor suits were a delight. Bobby Deol looked emaciated and too shiny and his presence seemed pointless except as competition to break the dynamic between the three flatmates. I thought Neha was self absorbed and clueless but I thought that seemed about right for the imaginary Bollywood "Fashion" industry - her job made as much sense to me as Preity's in KANK. Priyanka did manage to get some nice moments with the boys. But really - who wouldn't like to be taken on the date John arranged complete with KKHH and rain effects? Sooooooooooooo true, Beth. So true. *nods nods like another puppy* Although I have to admit I loathed John on the first viewing but actually began to appreciate him a little more on the second viewing ... it almost seemed like he was taking the piss out of himself at times, and especially when he went all camp in the presence of Boman. That filmi kiss at the end though ... wasn't that just marvellous on so many levels? Classic non-kiss in classic filmi tradition, right? And omg, the scaredy cat reaction! Sent me into fits of relieved laughter cos omg I am EXACTLY the same, I do the exact same twitches and looks over my shoulder. *cries wif laughter* I'm so glad I'm not the only one, I never knew! Still can't forgive him for Delhi-6, though. Beth, I'm glad you wrote about Dostana. I couldn't make up my mind whether it was basically gay-positive or relied too much on queeny stereotypes. Of course the answer is: both! Despite the camp obviousness of much of the humor I was very entertained by the first half. And I'm with dri on the positive effect of Bobby Deol's new haircut. But the film lost me when the boys started manipulating Abhimanyu in order to break up his budding romance with Neha. It seemed highly unlikely that someone who has risen to the editorship of a major fashion magazine would so readily embrace the Really Bad Ideas the boys come up with (fugly clothes, churlishness, etc.). The whole sequence seemed mean-spirited (which the first half's camp humor never does, thankfully). You've made me want to watch the film again. I totally agree with you. It was a lot of fun, despite the flaws. And Abhishek came into his own. My biggest grudge against him is that he tends to sleepwalk through a lot of his roles, but here he's clearly all there, and having fun too. Love your reviews. Esp liked your bit on Dostana. Was more fun and entertaining than the movie. Loved the scrolling images of Abhishek and his scarves! Great Idea.. I more or less agree with you on this one-- I was so, so afraid when we sat down to watch it, but what stuck most in my mind was the portrayal of the Iraq veterans: campy, but honestly sweet and focusing on love rather than "what they do in bed," which anti-gay people just cannot seem to do. I don't think I could watch it again, even with the fabulousness that is Abhi-- too much John Abraham (snore), too much Priyanka (she is OK but meh), and the only time Bobby Deol has ever done anything, anything at all for me was in the much-panned JBJ. But there were a lot of great little moments in it. My favorite was the fantastic satire on K3G that KJo allows his disciple to make-- the bloody repetitive "Khabi Khushi, Khabi Gham" theme on tape while Maa receives John as her new daughter in law. That was brilliant. Fun fun fun! Great review Beth - way better than mine, that's for sure! I really enjoyed this movie, Abhishek was by far my favorite thing about it though. It certainly had it's fair share of campy moments (looking back I have to say that Boman was hilarious and is quickly becoming one of my favorite most versatile actors with each new movie I see him in). I totally agree with dri though, the only thing I enjoyed about Bobby Deol was his hair cut. Also, LMAO over the scarf slideshow! Ah, our Bollywood men and their love of neckwear! I love this movie, drool on the floor, chew marks on my shoes and all. Has Karan Johar really made a half good picture - all of his films are very derivative, formulaic and cynically aimed at the NRI overseas audience; Dostana could have made for interesting cinema but it fails to generate any kind of emotional response other than contempt. Nice Blog though, I will add you to my blog roll.